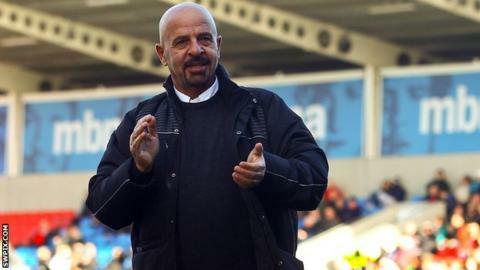 Salford owner Marwan Koukash has said he is no rush to decide on the future of absent head coach Iestyn Harris. Harris, 39, has not been present for a Red Devils game since the Super League defeat at Hull KR on 30 June. Koukash has previously said Harris is missing because of illness. The former Wales international's assistant Ian Watson has been in temporary charge. "There's no timescale. We could wait until the end of the season," Koukash told BBC Radio Manchester. "We are in no rush to make that decision public and it's not for public consumption. "We'll just wait and discuss it with Iestyn when he and us are ready and we'll move forward." It has been a difficult time for Salford, with Kevin Locke quitting the club, Theo Fages offering his resignation and Tony Puletua deciding to take legal action against the Red Devils. But Koukash has denied reports that more players will depart. "Everyone has got a contract with the club next year except Scott Taylor," added Koukash. "We've not been approached by any other clubs regarding the availability of our other players. "I've heard the same rumours there's mass numbers of players who want to leave the club. "The only three that I know of that will not be returning - obviously Kevin Locke has resigned and gone, Theo, and Tony Puletua is on loan and we won't be renewing his contract."